Kathryn Bertine is a former Division I rower and a professional figure skater and triathlete. She is the author of All the Sundays Yet to Come and As Good As Gold. She wrote the “So You Wanna Be an Olympian?” column for ESPN and the “Riding with the Pros” column for espnW, where she also worked as senior editor. She lives in Tucson, Arizona. How do you know what road to choose in life? How do you find the courage to admit that “normalcy” is not fulfilling? And how do you begin to choose a new dream? 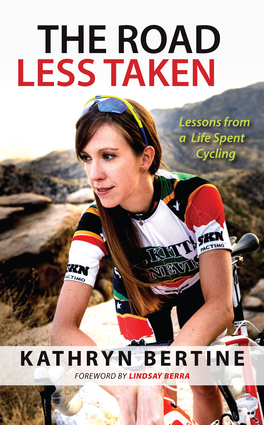 Kathryn Bertine explores these questions and much more in her new book, The Road Less Taken: Lessons from a Life Spent Cycling (Triumph Books, September 2014). Centering on her decision to pursue a career in professional cycling, Bertine uses her experiences on the bike as a metaphor for chasing one’s dreams. Her story does not only apply to athletes; on the contrary, Bertine’s book is for anyone who has ever had a desire to pursue something different in one’s life – with or without a bicycle. The Road Less Taken is meant for all who seek to challenge the ordinary path and pursue their dreams. Whether you are an avid cyclist or haven’t ridden a bike since childhood, this book is for anyone who yearns to make a change in their life and truly fulfill their potential. Kathryn Bertine is an author, activist, filmmaker and currently a professional cyclist for Wiggle-Honda. She was a former Division I rower, a professional figure skater and pro triathlete. She is the author of two memoirs; All the Sundays Yet to Come and As Good As Gold, as well as a former columnist for ESPN’s “So You Wanna Be an Olympian?” and espnW’s “Riding with the Pros”, where she also worked as senior editor. Bertine’s documentary Half The Road: The Passion, Pitfalls and Power of Women’s Professional Cycling is currently in theaters and available on iTunes and DVD. She is the founder of Le Tour Entier, the social activism team that helped launch the La Course, the 2014 women's Tour de France. She lives and trains in Tucson, Arizona. Find her online at www.kathrynbertine.com and www.halftheroad.com, and on Twitter @kathrynbertine and @halftheroad.